There will be many Memorial Day events throughout Orange County today. The Register has at least a partial list. 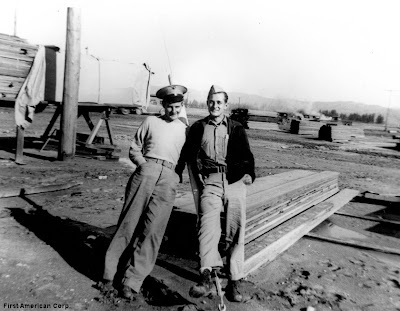 Today's photo (above) shows two Marines at the El Toro Marine Corps Air Station in 1942, when the base was still under construction. On this day, in 1846, the Rancho Lomas de Santiago was granted Teodocio Yorba. This later became the northern end of the Irvine Ranch, including some of the land on which MCAS El Toro was built. Bill Kirkwood, WWII Navy veteran and longtime County of Orange employee, passed away May 14th. Among his many accomplishments, he played a leading role in computerizing the Orange County Public Library. He also wrote a history of the County Library. Kirkwood's obituary - with much more information about his life - is available online. I worked with Bill Kirkwood several times during my career with the County of Orange. He had a fine mind, was a very good administrator and executive, and was widely respected in the County.